210 records – page 1 of 11. BC Centennial Parade 1958 Smithers, B.C. The Agricultural Experimental Farms Float being pulled by a tractor. Map of dominion experimental sub-station in Smithers, B.C. The fonds is arranged into two series, Administrative and Fall Fair and contains prize lists, prize tickets, meeting minutes, correspondence, financial statements, entry forms, certificate of incorporation and a brief history on the founding of the fair. Talk of forming a Bulkley Valley Agricultural Association to oversee the planning of an exhibition began in 1910 (Interior News, May 1910). Various names were used before incorporation, such as: Bulkley Valley Agricultural Association (Interior News, July 27, 1912), Bulkley Valley Agricultural Association and Farmer’s Institute (Omineca Herald, June 7, 1913) and Bulkley Valley Agricultural and Industrial Exhibition Association (Interior News, June 21, 1919). On July 14, 1919, the Bulkley Valley Agricultural and Industrial Association was incorporated under the Agricultural Act. The mandate of the Association was to "advance the interests of agriculture and to hold an annual exhibition of agricultural products at Smithers, and to do all such other things the directors may decide for the advancement of the association, the farmers and farming." 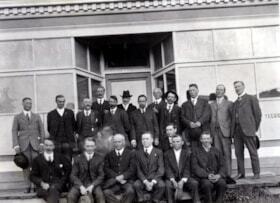 The first directors of the Association included A. Kilpatrick (President, Smithers), J. G. Wood (Vice-President, Telkwa), and L.B. Warner (Secretary Treasurer, Smithers), George Oulton (Smithers), A. J. Prudhomme (Telkwa), E. C. Barger (Telkwa) and William S. Henry (Smithers) (Interior News, June 21, 1919). 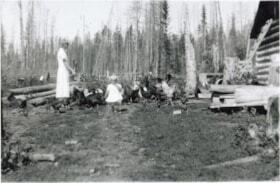 Smithers held its first Fall Fair in Albert Park, September 30th, 1919. After several years the Fair became a three-day event, presenting a wide variety of exhibits including agricultural displays, livestock and logging shows, handicraft and homemaking exhibits, stage shows, and a midway. Records were rearranged in September 2016 by Manda Haligowski to better reflect archival standards and to improve accessibility. 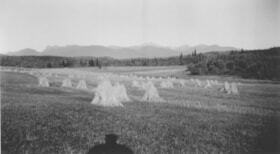 Dominion Experimental Farm at Smithers, B.C. Title based on the image caption. Established as an experimental substation in 1938 and an experimental farm in 1955. Located on the old Sproule Farm between Smithers and Telkwa. The directors were W.H. Hicks and K. McBean, and the farm provided information on the major agricultural problems of the area. 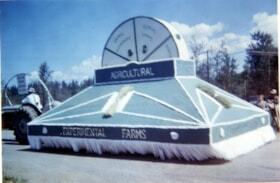 Historical information from BV Museum reference file; INDUSTRIES/AGRICULTURE - dominion experimental farm. The Agricultural Advisory board and others in Smithers. J. Sealy top row, third from right. Dr. Wrinch top row, far right. Appears to be the Dominion Telegraph Building. Written on back: "Agricultural Advisory Bd. (& others); July 1919"
Item is a postcard featuring six Indigenous men posing with the hay they have collected. The ranch was located six miles north of Houston. It encompassed 3,120 acres by 1908 and was once owned by the Government until Barrett, Charleson, and Sealy bought it. 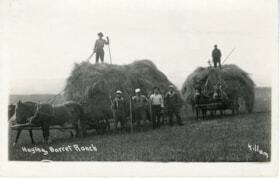 By 1910, only Barrett owned the ranch. 1 photograph: b & w; 27.5 x 7cm. Item originally collected by Addie Hann (nee Bannister). 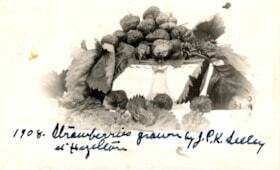 Written on back of postcard: "Landed in former Bill Sproule's farm, now Experiemental farm sight [sic]. where beams now stand. early 1920's" and "Property of A. Bannister"
Item is a poster describing the characteristics of different grades of Canadian eggs. ORIGINAL INDEX CARD MADE UP FROM ACCESSION REGISTER. ORIGINAL INDEX CARD MADE UP FROM ACCESSION REGISTER INFORMATION. Old wooden wagon has four wooden spoked wheels with metal and wood undercarriage. The top flat surface of wagon has ten wooden boards extending the width. Two small metal foot petals exist on one side of wagon. Old wooden wagon with four spoked wheels. 190CM wooden hitch attached to front of wagon. Wagon has four steel spoke and rim wheels with the front two angled inwards. 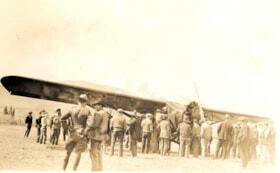 The undercarriage is metal and there are slight wooden walls with both of the small ends open. The inside of the wagon has metal braces angled inwards with some boards attached creating a 'V' shape. Boards are missing and two exist on one side and one on the other. All metal rim and spoked are painted grey with the center hubs red in color. The other steel parts on the wagon are painted black. The wood is greying and black in some areas. Wooden ore wagon has an open belly with angled feeder inside. The front two wheels are leaning inwards to accommodate the heavy ore loads. Title based on information provided by donor. Malkow Lookout in the background. Mesich farm was near Glentanna Corner. 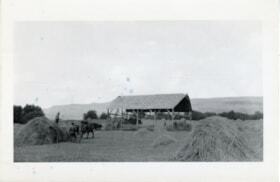 Written on back of photograph: "this is shed near Oultons [sic] taken 1924"
Title based on information written on back of photograph. Written in a different handwriting: "possibly Nancy?" 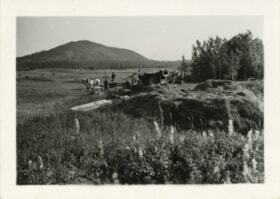 Written on back of the photograph: "Owen's farm"
Title based on description on backside of photograph. 1 photograph: b & w; 11 x 6.5cm .